Homemade is the best, especially when it’s from your kids. Little ones love to create especially when it’s for mom and dad. This week’s blog will teach you how to make a 2016 Father’s Day card for kids. There is nothing better than a homemade card and not to mention cute. So this Father’s Day break out the crafting supplies and get creative. We have provided a couple of ideas for cute homemade Father’s Day cards, as well as a quick clean up guide in case of an accident. Start by having the child place their hand on the color of their choice of construction paper. Trace the right hand with a pencil and then the left hand either with the same color paper or a different color. Leave it up to the child. Cut both traced hands out. Choose one of the hands and have the child write, or help them write “I love you this much” on the palm of the hand. If you like, you can have them write another message on the other hand like” Happy Father’s Day”. Next, take a piece of construction paper and cut a 1-inch strip from it the long way. Take the strip of paper and fold it accordion style so it is in about half inch sections. Place some glue on both ends of the accordion strips. Then, place the glue side of the paper onto the back of each hand. Allow glue to dry. Fold the watercolor paper in half. Arrange masking tape on top of the card to say “#1”. Tape down the card on a surface that you are allowing your child to paint on. This will keep the card from moving around during the messy painting. Have your kids put on a painting smock or clothes that are okay to get paint on. Then, let them go crazy with the finger paints. Encourage them to paint the entire card and to use whatever colors they want. Allow the paint to dry, then remove the masking tape to reveal the # 1. Then, use a dark mark to write out “Dad” under the number one. Then write out a message or have your child draw a picture on the inside of the card. Crafting with kids will no doubt get messy. Finger paints will wash easily from hands and skin. But it will take a little more effort if the paint ends up on carpet or upholstery. Don’t panic if a little bit of the paint ends up on the carpet. We have provided a guide to help remove finger paint from carpet. If the paint is still wet scrape as much paint up as you can. Then blot the area with paper towel or white cloth. Put a damp cloth over the area to keep it from drying out. If the paint has dried then brush as much paint as you can using a hard-bristled brush. Mix a cleaning solution of dish hand detergent and warm water. Sponge the cleaning solution onto the stained area. Blot the stain using a fresh cloth or area of cloth to avoid the stain from spreading. If the stain has not come up then, blot with rubbing alcohol and a fresh white cloth. Repeat until stain is gone. Blot the area with cool water using a fresh cloth. Soap or rubbing alcohol left on carpet can lead to discoloration and damage. Blot area dry with fresh cloth. Too much moisture left on carpet can lead to mold or mildew growth. Life can get messy, especially with little ones. No need to stress about a little mess. 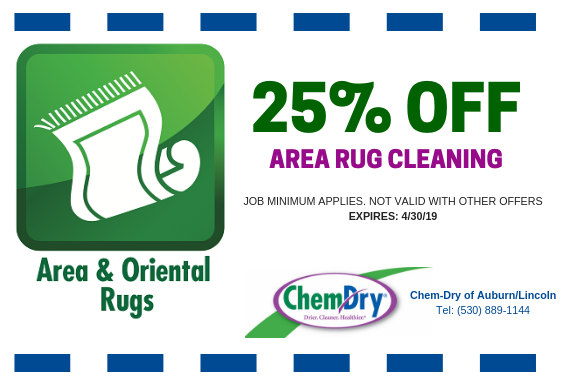 The professionals at Chem-Dry of Auburn/Lincoln are trained to deep clean carpet and upholstery. 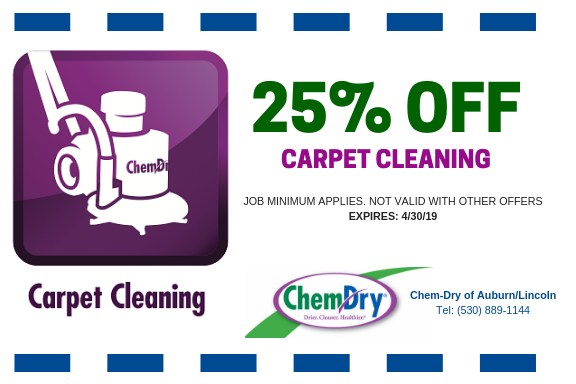 It is recommended that you get your carpets cleaned at least once a year. 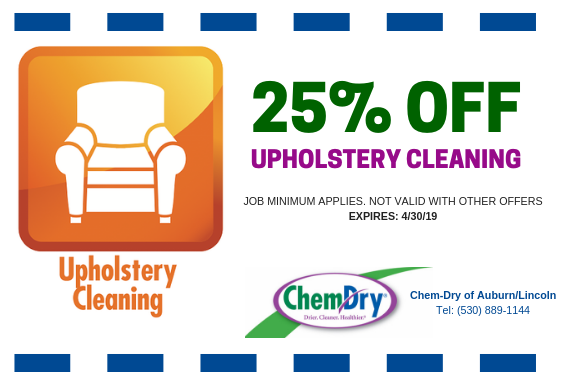 Chem-Dry of Auburn/Lincoln uses a 100% green certified and eco-friendly cleaning solution so it’s safe for you and your family. Dirt and stains are no match for Chem-Dry of Auburn/Lincoln’s powerful yet natural cleaning solution paired with the most innovative equipment. Other carpet cleaning services rely on chemical soaps to clean carpet and then use gallons of water to attempt to rinse it. Unfortunately, completely removing all the soap is difficult and soap left can lead to a residue build-up, and the excessive water means hours or days of damp carpet. Chem-Dry of Auburn/Lincoln does not use soaps so there is no need to use gallons of water. 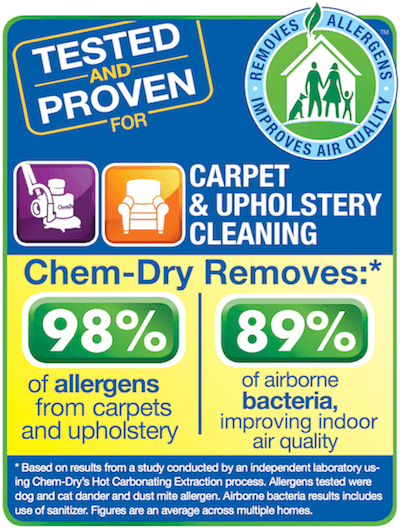 Chem-Dry of Auburn/Lincoln truly is the Drier, cleaner, healthier choice.